Seductive product descriptions can mean the difference between moving units, and watching your inventory decompose. If potential customers are not convinced to purchase after reading your product description, you have some work to do. Here are some crucial ingredients for eCommerce store product descriptions that sell. Before you can hope to sell online, you must learn your customers. One of the most effective ways to improve your product descriptions is to gear them towards individual buyer personas that you have previously researched. The ideal buyer persona helps to quantify the behaviors of your prospects and customers, giving you more of an opportunity to compose product descriptions that will actually be effective. For example, knowing that previous customers enjoy your products because of their durability may encourage you to use language that refers to product longevity in your descriptors. However, if your loyal customers are basing their shopping cart decisions on product upgrades, you can compose a different product description for that audience that includes the new features in the upcoming iteration. As exampled below from Josh Rosebrook, it would be all well and good if the writer had left the underlined sentence as: “Unique herbal synergies release skin transforming anti-inflammatories, antioxidants, fatty acids and phytonutrients.” However, translating those ingredients into tangible benefits makes it that much more desirable. What problems does your product take away? How does your product make people’s lives better? If you tell people within the product copy what’s in it for them rather than just what’s in it, your product descriptions will likely gain a great deal more traction. There’s no better time to take advantage of social proof than now, when the Internet is literally at the tips of our fingers. We’ve all found ourselves in situations where, being so overwhelmed with choices – or at a loss of where to start searching – we’ve turned to Google. I can assure you that when your visitors are unsure about what product is the best to buy, they look online for suggestions. Like anyone else, they’re drawn to products with the highest number of positive reviews, or those accompanied by testimonials, or those featured by social influencers, or those featured in magazines. As shown below from Amazon, customers searching for swim goggles will be much more inclined to purchase one of these three because of the “Best Seller” tag and their visibly numerous and high reviews. There is hard psychology behind why we look to imitate other people in situations we are unsure of. If you can’t leverage the above methods of social proof, there are still other ways to include it in your product descriptions. For example, in line with psychology, buyers are attracted to things that are popular. Take advantage of this by highlight customer favorites on your home page. The tone of voice that you use in your product descriptions will make a huge difference in the way those descriptions are perceived by your audience. Marketing to the modern consumer means that you want to meet at eye level. There is nothing worse than sounding like a big corporation that is mass marketing a product. Even if you are scaling, you want to sound like the provider down the street. Your tone can also enlighten customers about your company culture. Millennials especially are very cautious about the companies they choose to patronize. They have so many choices that they can afford to forgo a product from a company they perceive as environmentally unconscious or socially disconnected. Let the personality of your company flow through your product descriptions to separate your sales techniques from those of your competitors. The attention span of the average human being is down – way down. Research has concluded that most people read less than 20% of any given web page. If you give people any reason to read less, they will. Some of the most effective techniques for product descriptions is to make the subheading slightly larger than the body text; use an easily readable, common font for the body text; and make judicious use of bold and colored text to draw attention to points that are especially important. Bullet points are also an incredibly effective way to grab one’s attention. However, do not forget to use plenty of white space in your product pages as well. Give the eye a rest so that it can take in the next point. No, the search engines themselves are not going to purchase your products. However, they control 90% of all Internet traffic. You should look at Google, Yahoo and Bing as three big customers that you will need to please on a daily basis. At the same time, do not try to game the system. The days of overloading product descriptions with keywords to gain a boost in search engine rankings are long gone. The most effective techniques for optimizing product description text all come back to the same thing – good writing. As long as you have one or two key phrases to focus your content around, the rest of your content should flow naturally and appeal to human eyes. Make sure that you optimize the images of your product with your key phrases and use the key phrase in notable portions of your text, including the subheading and any bolded phrasing. You may think you’re doing yourself a favor by including how “high quality” your product is, but they read as empty words to the average buyer. After all, how often does a vendor not describe their own products as being superb and high quality? Your product descriptions should be the final pull that reels your prospects in – they shouldn’t just exist just for the sake of it. Be as specific as possible! Describe your product in detail and how it would specifically benefit the customer. 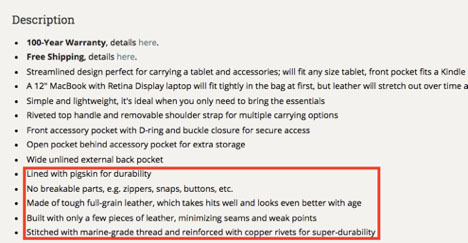 Instead of describing your item as being “high quality”, highlight the specific features that makes it a standout product. Take the product description below taken from Saddleback Leather. They list the features and benefits that illustrate the product quality rather than simply stating that it’s “excellent quality”. This specificity adds much more credibility to the bag’s caliber than if you were to simply state how “high quality” it is. The market is always changing, and your product descriptions must change as well. The most important ingredient for a great product description is adaptability. Take note of standout phrases that may be working for your competitors. Take a look at search engine rankings to see what is working in your market and other e-commerce businesses. Most importantly, listen to your customers on social media and on industry message boards. More often than not, you will be informed directly by your prospects and conversion rates on how to write product descriptions. 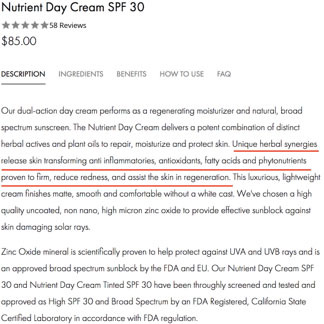 There is no single technique that will make your product descriptions go from zero to hero overnight. All of the techniques mentioned above work in tandem to improve visibility and readability. If you constantly improve your product descriptions based on the needs of your customers, your eCommerce website will have a greater chance of moving that inventory. Author Bio: Reuben Yonatan is the founder and CEO of GetCRM, a trusted comparison resource that helps companies understand and choose a CRM solution for their specific needs. With a 10-year track record in building, growing and strategically shaping operational functionality in all his ventures, Reuben helps small business owners align strategy with culture and improve overall company infrastructure.